Planning a trip abroad can be quite an undertaking, but if you do it right, it doesn't have to be an overwhelming experience. Here are five tips to help you plan your adventure abroad! John and I spent several months researching where we wanted to travel, and then several months learning more about where we decided to go. And honestly, that was part of the fun! Our biggest travel information resource was the man himself... Mr. Rick Steves! And lucky for you, Hulu has 8 different seasons available for your viewing pleasure! So figure out where you want to go and learn all about it! Once you figure out where you're going, it's time to start thinking about flights. For us, our flight was the largest (single) purchase of the trip. So to find the best deals possible, we used Skyscanner to compare dates and destinations of departure and entry. 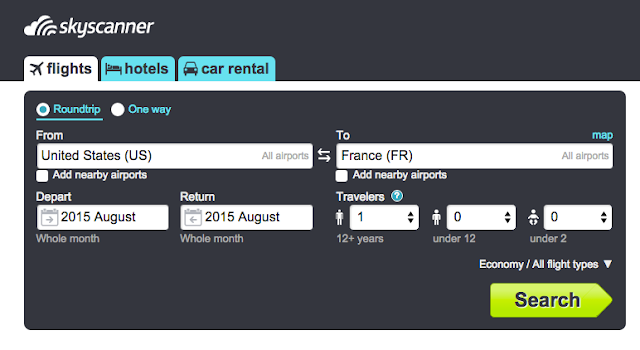 When using Skyscanner, you can type in generic searches like "United States" to "France", and Skyscanner will tell you the cheapest place to fly out of in the US and the cheapest place to fly into France (in some instances, flying into Nice was cheaper than flying into Paris!). 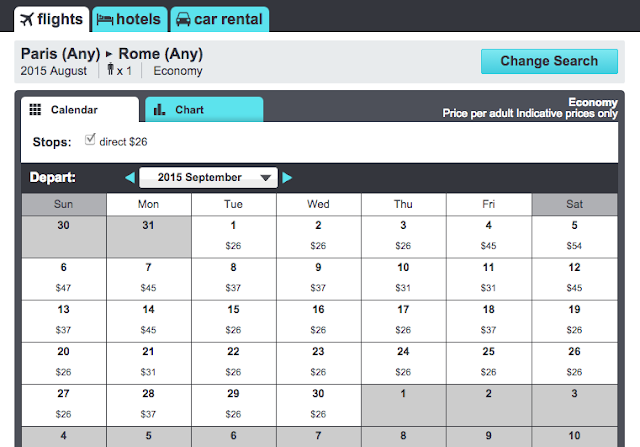 Also, if you can be flexible on dates, you can search full months to see cheapest days to fly out and return. 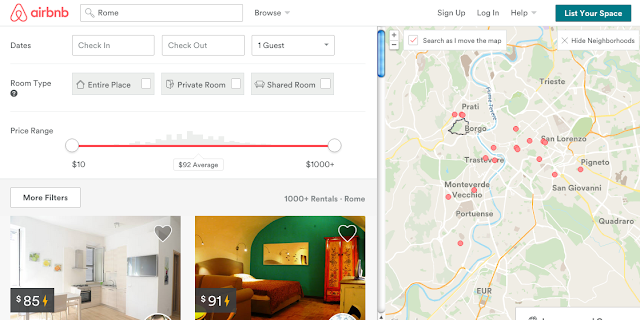 In Paris and Rome, John and I ditched the hotel and booked an Airbnb. Airbnb definitely has its advantages (and disadvantages), but overall, we were really happy with our experience. When searching for a place to stay, make sure you're clear on whether or not you're looking for an entire place (like we did), a private room, or a shared room. Also, you will need to filter for certain features like air conditioning and WIFI, if those things are important to you. The Airbnbs that we booked were a great value in a location that couldn't be beat... and it's fun to be around the locals! However, you won't be able to have a concierge call a cab for you at 6AM, so just be prepared for what you're getting into! Now that you've booked your flights and accommodations, it's time for the fun part... planning the sights you want to see! John and I knew that we wanted a full agenda - we were good with waking up early and going to bed late since we were only going to be in each location for a limited amount of time. To make the most of our daily itineraries, we used Visit a City which was absolutely amazing!!! On the Visit a City website there are itineraries for all of the major cities to see the major sights based on how many days you're going to be in the location. You can add and remove sites from your itinerary and totally customize it (then print it!). The itinerary details the walking distance between each site, a map to get there, a little blurb of history, the hours of operation, and whether or not there is a fee to enter - basically, it is an amazing resource! The biggest expense is getting abroad, but once you're there, intracontinental travel is quite inexpensive. John and I started in London, took the chunnel to Paris and then took a one way flight to Rome. 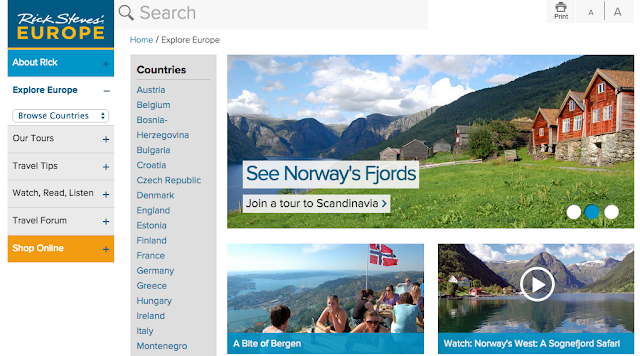 When looking to travel between countries, explore the planes, trains and automobiles! As far as flights, it is very common to find one-way tickets for under $40... just be prepared that you will be paying for extras (bags, snacks, etc.). But for that price, why not head to Barcelona too?! Flights are cheap and quick way to travel, but trains (if you ask me) are fun, a great way to see the country side, and definitely more comfortable than flying. Similarly, renting a car and driving allows you the freedom to stop and explore as you please. Figure out your preferred way of travel and start adventuring! We booked the majority of our reservations before we left, and on two different occasions the credit card company flagged and cancelled our purchase. To avoid this, make sure you tell your bank that you're leaving and how long you plan to be gone. This is so important to make sure you have access to money once you get there! This may seem like a silly one, but believe it or not, when we were in France, there was actually a travel advisory due to a terrorist attack south of Lyon. Better be safe than sorry on this one - and it takes 10 minutes tops... so register your passport, just do it. If you're staying at an older hotel, I wouldn't count on having US plugs available for your iPhone or camera charger. So don't forget a converter and adapter or two. Since John and I were planning on staying at Airbnbs, we knew that we wanted to get some sort phone plan to use in a case of an emergency. For $40 we were able to get 50 minutes, 50 text messages, and a very small amount of data. We didn't really need any of it, but for $40 the peace of mind was worth it. In case you didn't know, you can use the GPS function of your iPhone's Map app without utilizing any data (at least with Verizon). You can't search a location without data, but you can still utilize the maps to see where you're located (with the pin drop). You can also see the names of the streets and major sites... it was super helpful when wandering around looking for things! Now it's your turn! What are your tips for planning an adventure abroad? Amazing tip! Planning a vacation to Greece with my family and will definitely be coming back to these. Never heard of an Airbnb before now… what a neat idea! Did y'all stay in someone's house? So cool! I love Skyscanner! It's such a great flight planning tool! And yes to telling your bank you're leaving! I forgot to do that once and it was such a mess. Skyscanner is AMAZING!!! lol, so... We got to Rome and I thought I had our plug adapter... Yeah, it was the one for Australia. I grabbed the wrong ones... Oops. I love checking out Viator to see what tour activities are offered - it's how I get ideas, even if I don't end up directly booking through them! Love these tips!! Wish I was planning a trip abroad in the near future, but I'm afraid it's probably a long ways out. I'm dying to do greece one day soon!! Definitely checking out that Visit a City the next time we travel! Thanks for your tips! I have heard so many great things about AirBNB. I'll definitely have to check it out! Fall Getups in the Summer Heat!